I was recently introduced to Harmony when she made a comment on my blog. I'm always intrigued when people i haven't met yet find my blog. [even more so, when they post a comment and say hello.] So of course, i had to check out her blog. 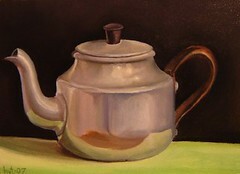 As soon as i saw the beautiful tea pot paintings, i knew i had to write about her. 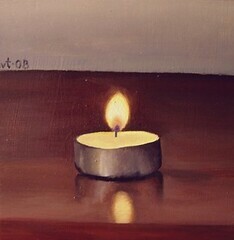 Harmony has a shoppe called Harmony Vanlue Tanguay and has beautiful oil paintings. 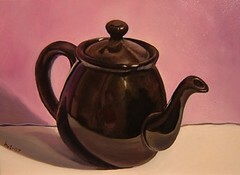 Not only does she paint lovely tea pots, but has a great style, painting angles and objects that are sometimes missed in everyday life as art. 1. I have been creating in one form or another all of my life. My mom is a seamstress (and fellow Etsian - uniquelynancy) and my dad is a carpenter, so I don't think a week went by as a kid when we weren't doing some sort of craft project. 2. No, painting is actually a fairly new pursuit for me. I went to school for theatre, graduated and moved to New York. While there, I began figure modeling for artists to make money while I auditioned. 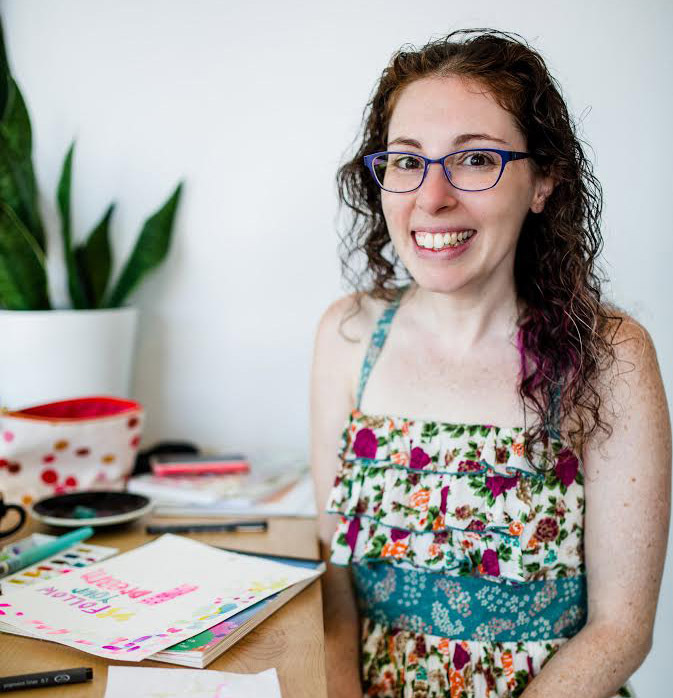 I became increasingly interested in the visual arts as a result, and eventually ended up studying with two of the teachers I had modeled for in the fall of 2006. That was my first official art class. I've been painting seriously for about 3 years now. 3. Oh man, so many people and things. I see potential paintings pretty much everywhere I look - the open doorway of my bathroom, the spices on my kitchen shelf, the faces of my friends and relatives, the landscapes of my town. There is really so much beauty everywhere, and in the simplest of subjects. It's overwhelming. I actually have a list of things waiting in line to be painted right now! I'm also inspired by other painters, past and present. Seeing great work inspires me to work harder and improve with every painting I make. 4. It's been challenging for me because art is a tough market to get into, and because this is a relatively new venture for me. 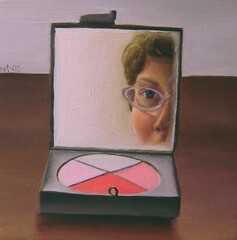 Buying art is a very personal experience for people, and I know my work isn't going to appeal to everyone. But I take comfort in knowing that someday the right person will come along and fall in love with one of my pieces and give it a great home! I've gotten wonderful feedback from buyers so far, and that makes it all worth it! 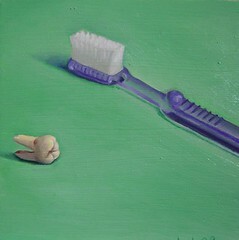 Check out her Etsy site, and look at her paintings of silverware, they are really swell too! :) Oh, and say hello to Harmony, she's very nice! 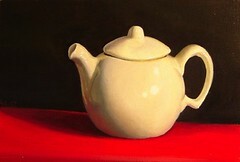 In "Art", "Paintings", "Tea", "artist", "harmony", "interview", "tea pots"